Next post: Blogging should not be this hard. Thanks this week to Ardmore, Pennsylvania writer, Marian Birkeland, for her wonderful (perfect for Mother’s Day) essay, and to reader, Heather Ordover, whose dulcet tones can be heard on Craftlit:a podcast for crafters. It’s time again for Eurovision! Learn more about it, then vote with me (if you’re in Europe) for Serbia to win! * Check out Turkey’s answer to George Michael, and Switzerland’s DJ Bobo, whose single Vampires Are Alive did not, sad to say, make it into the final. I think they were trying too hard to be Lordi. Not officially “open for business” yet, but do check out Ravelry, the new home for knitters on the web. Two new knitting podcasts have joined the podcasting family – Knit Picks Knitting Room and Changelings Knits and Stitch. Visit their websites and give them a big howdy. I am always happy to pass along information on charitable knitting projects, and few have touched my heart like this one. I am Casting on for Kenya, and would love for you to join me in sending knitted love to children living with HIV/AIDS in Africa. 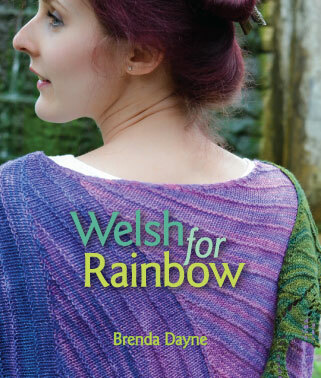 Visit lovely Hay-on-Wye for great used books, knitting and otherwise. As promised a picture of the Sunrise Pullover, in progress. The finished sweater will appear in my new blog next week. When it’s ready, there will be a link in the sidebar. Thank you, my knitsibs, for listening. * Serbian singer, Marija Serifovic, won the hotly contended Eurovision Final, with her song, Molitva! I’m always happy to see a new Cast On in my iTunes! Hooray! While I loved the story from the last show, I don’t agree knitting is ‘political’ or should be. You of course may choose as an individual to express values in your knitting. You may want to personally support charities, organic fiber growth or be anti-mass production. I wouldn’t call this ‘political’ since politics implies an authoritative, decision making group. Knitting can bring people together but you can count on politics to break any group apart. There used to be a knitting blog I avoided because the author mixed the two and I was very apposed to her political views. No great free pattern or finished object could lure me to her site, because I knew my blood pressure would just rise reading it. In short, ethical knitting is an expression of the knitter’s personal opinion that I can accept. I may not be vegan but I’m down with the vegan knitter’s personal choice and values. Politics you are either ‘with’ the group or ‘against’. I can’t agree to disagree on something like (to avoid current issues) the Nazi Party. It just struck me that you would be the perfect one to interview Alice Starmore and/or June her daughter. Her work is so wonderful it would be great to know if they ever plan on publishing anything (a book) again. I adored last week’s essay, I found it very moving. I also have no problem with knitting being used for political aims (like the Water Aid blue blanket, for example). Knitters are a broad enough church that we can pick and choose what and who we support: it’s up to individual knitters to make decisions on what sort of fibre to use, which fibre companies to support or refuse to support, what charities, if any, to knit for. As long as we’re respectful of other people’s choices, I don’t think it needs to be a divisive issue. Wow, Tom Waits. My husband will be so impressed. Thanks for doing what you do… I know I can speak for a whole bunch of people who would say they and I appreciate it! I haven’t had this try to download into my itunes yet – but I’ve still got all those “back issues” to help me wait. 6. use of intrigue or strategy in obtaining any position of power or control, as in business, university, etc. I don’t know any people who are trying to take over the world, or trying to gain political office with their knitting. I do know many people (political and other) who just might have their blood pressure lowered by being introduced to such a meditative and wonderful artform. As a direct result of this they may make better decisions in these offices because they took the time slow down and think before they acted. I also agree that things might be different if knitting were brought in to the room when decisions regarding the fate of huge groups (or even small groups for that matter) of people are to be made. Making decisions about huge bodies of people has a tendency to make those in the decision making seats see human beings as widgets as the human-ness is taken away from the body when numbers and difficult decisions regarding those humans have to be made. Sage wrote an essay about how a father loves and wants to keep his children protected. That, to me, is one of the greatest things about our art – knitting and crocheting…it can be used to show love and give protection both physically and emotionally to those we share it with. On many, many layers knitting is very political…it gives us the power and ability to do this. It is universal, as you pointed out Brenda, it crosses language and cultural barriers. It gives us the power to share with each other, even though we may not be able to verbally communicate with one another. The act of knitting is a STRATEGY that I personally have used in the past two years to gain POWER over the pain of Diabetic Neuropathy (I didn’t even know this sort of pain was possible, and I feel the only way I made it through it was knitting…politicking for my own health). The politics of knitting, to me, means how can we brighten the world for ourselves and those around us (hence the group you referred to that is sending blankets to children with AIDS in Kenya, or the Dulaan group) using our intrigue and strategy to gain power over sadness, bleakness, and pain in our world. I may be mistaken, but I believe that when you referred to the word politics this week, this is the sort you meant and in many ways it went far beyond donkeys, elephants, and Nazis. Sherry W. I checked out your blog and you appear to be a delightful woman. I also agree with many of your thoughts on national politics – I just don’t feel that that is what was intended in the podcast this week. Bravo Brenda, I have been a huge fan of your podcast right from the beginning, and the past two have been especially wonderful. Hi Brenda, I wanted to respond to your ‘you got a dollar?’ request in a previous show. I tried to pay Â£1 for my download this week but Paypal, with which I had some difficilty, has only taken $1. To pay you 52p for the show looks insulting but I don’t mean it to be. I’ll try to work up to bigger and better things in future weeks. Thanks for hours of entertainment. Just to say thanks for another wonderful podcast. Your music choices are always so nice, and I really enjoyed the Secret Life of Stitches! Weirdly I found this episode inspiring, not in terms of knitting, but in terms of my academic work. There must be some logic there somewhere, but rather than pausing to figure it out, I am simply going to get on with it…before spending my evening with Eurovision. BTW. If you have teletext/ceefax (or digital, I guess, I’m not that high-tech), then the subtitles can be _very_ amusing! Thanks for another delightful podcast. I have to admit that I’m incorrigibly addicted to listening to Cast On and surfing Wikipedia, so I was very amused when I popped over to Wikipedia right after listening to this podcast and found their featured article for the day (Sat, 12 May) was Eurovision! It’s probably featured since it’s going on right now, but I was still tickled by the coincidence. Thanks for pointing to the Eurovision site, I watched it and it was fun. I want to congratulate you on yet another great podcast, and in particular, I loved this week’s Secret Life of Stitches. I also wanted to sound a note of support for what you said about the “political” content in the last podcast. For me personally, politics and knitting both play a very large part in my life, and I do not section my life off into political and “other.” It is not about who is for or against, but how we govern ourselves. At its simplest, politics is about who gets what, when, and how. This simplest form of politics takes place every moment of every day of our lives. I often read the blogs of those that do not ascribe to my views, whether they be about politics or knitting. I listen to podcasts to hear other voices. To me, there is no point otherwise. While you don’t want to offend listeners and lose them, you don’t want to lose your own vision in the process. Listeners do have the choice to unsubscribe, but I hope that they would not, as perhaps listening only to those who think the same way would get very boring indeed. However, the content of Sage’s essay struck me not so much as overtly political, but overtly cultural. Here in the US we are inundated with the political aspects of what is going on everywhere in the world, and what this means to us. Often times, we hear what this means to us only. What do Americans get out of this situation? In our media, we rarely hear from those in the other nations affected by our actions. Whether or not I agree with whatever political views Sage may hold, I appreciated hearing a snippet of what those in the Iranian culture might hear. It is representative of what their media brings home to them nightly. The media is an outcropping of the culture, and that of the US may vary widely from Iran’s and even UK and Canadian media. But what Sage brought home was the fact that in another country, so incredibly foreign to many of us, a man takes the time to craft an item for his son, one stitch at a time, just as my mother and grandparents have done for me, and I hope to do for others. While wars and drama rage and affect every culture in a different way, in the more mundane aspects of life, we’re very much alike. Delurking (even though I listen all the time) to say Happy Mummy’s Day! Hoping you have a joyous day! Another fabulous podcast, thank you! I’m croggled – folks didn’t like Sage’s (fabulous, heartwarming) secret life of stitches essay, or don’t like “political” anything, because of (witness above comments) holding such widely disparate ideas on definitions of political, or what an expression of commonalities (comfort found and given through knitted things) across different cultures? aaah, hum. I loved Sage’s essay; and I love this cycle’s theme, with the secret lives of stitches, and what it sounds like folks are contributing. Happy Mother’s Day; I also enjoy the stories of your sons. Have you read Fannie Flagg’s book, Standing in the Rainbow ? One of the major characters is a backyard radio broadcaster, over decades, from her living -room studio (with the young kid slamming the screen door as he comes and goes; and a live radio studio audience in the folks who wait on their porch, or alight from the greyhound bus stop in front of their home. It’s a hoot, and heartwarming, over a couple of generations of middle America. Eurovision sounds like a lot more just plain fun than, say, Idol whatever on US teevee. So, how’d Serbia do? I hope I didn’t sound like I disliked Sage’s essay. It was fantastic as far as I’m concerned. Period. Knitting and Crocheting are wonderful pursuits. I hope I didn’t offend anyone, that was not my intention. Awesome podcast as usual. Loved the Tom Waits. I’ve been listening to the show sense episode #1. When you talk about how long it takes you to do a show and how you are trying to find a way to make a living at it, it makes it seem like you hate podcasting. There was a lot of joy in the first shows and now it sounds like you do it because you have to. Which makes me not want to listen any more. I’ve often wondered how many hours it takes to create this podcast because it is so very well done. You’ve come a long way since Episode 1 (which wasn’t at all shabby!) I don’t know how you manage it all, you are an inspiration! You deserve a big plate of fresh baked snickerdoodles for all your hard work! (I hope you like them, they’re my son Zack’s favorite cookie.) Your podcast was part of my wonderful Mother’s Day! I hope yours was fantastic. Thanks for another great episode. I listened while I was gardening today with my family’s help: their labor for my labor on this Mother’s Day. Anyway, I want to thank you for pocasting Sage’s deeply moving story. Too many people in this world don’t have the luxury of forgetting today’s political realities. Those of us who can forget need to be reminded. Thanks again for doing just that. What a treat! Having you and Tom Wait together in one podcast episode sends me to heaven. I am into my third listening of this episode, and I love everything so much. Thank you. The music as always is great (this Fly Fly Fly song stays in my head, advantageously replacing the Bach’s cantata I sung this week-end. a little more easy going, you see…). The stories are wonderful and hearthwarming. As for the Tom, my all time favourite, The one I listen to a thousand times and more, is his album “Closing Tome”. Please could you tell us more about the blankets for Kenya project? I couldn’t find anything about it on the Slum Doctor website. Love the show as always. I found this week’s essay very moving and meaningful. I hope to actually teach my mother to knit at some point. my grandmother was the great crafter in my family and my mother seems to have gotten skipped by the domesticity gene. The essay made me really feel how my carrying on the craftiness of the family is important (especially as an only granddaughter). Also I loved hearing Tom Waits on your show. I had no idea he had another album released! Brenda–I want to talk to you about sponsorship. Please drop me a line! yay! new cast-on I can listen to on my new birfday iPod! but mostly I just dropped by to say ,”Happy (slightly belated) Mother’s Day”! Thanks Elisa for a much nicer way to state how important it is for us in the US to realize what we allow our leaders to do in other countries (& that it is not as great as our propaganda machine that passes for news may state). The only thing that I can add is that people who don’t like what they are listening to should exercise their personal right to turn the device off–be it TV, ipod, or PC. Brenda, I love your podcast. I look forward to each episode. I enjoy your different view point living outside of the US. Your stories are fabulous & most of all, thank you for allowing yourself to be human “on air”. Your podcast is so professionally done, that I think some people forget that it is great because it is a reflection of YOU! Please continue to express your opinions on knitting, politics, life & whatever else may cross your fancy. Brenda: Glad to see that you’re back with another wonderful and enlightening podcast. They are never dull and I love to hear what’s going on in your life and on your needles. Stay well, dear lady. You still taking donations for the Dulaan project or can you tell me where to post to? Many thanks. I cannot believe that people were complaining the last episode was too political! I didn’t hear it like that at all – although maybe it was a rude awakening for people who aren’t used to hearing the point of view of people in another country and that’s what made them feel uncomfortable? I really enjoyed (and found very moving) Sage’s story – it was nice to see crochet in a completely different context to the one I’m used to, and very thought-provoking. I’ve been listening to your podcast from the beginning, and really enjoy it – thank you! I was wondering what has happened to the Chub Creek Boys? The last Journal entry I see was on December 23, 2006. Did they get lost on their World Tour? Thanks for all the time and effort you put into your show. wow, you really do censor. My post was removed. Guess you thought I flamed you but honestly, I do feel that sage is immature and it was a poor choice. I’m sorry that you felt the need to remove my notes. I’m from Iraq and know what censorsip really is, I suppose it shouldn’t bother me, but I thought in the UK it was different. But it’s not. maybe my english wasn’t up to your standards. Thank you for another episode of this wonderful podcast. Not only did I enjoy it, but I was also thrilled to find that you’re a Eurovision fan. My husband and I watched as well and we enjoyed the usual rollercoaster ride in musical skills, taste and costume design. We were a bit disappointed with the results for the German entry, but we have learned not to expect too much from the votings. The show itself is fun enough to watch. Hope to hear again from you soon, I enjoy your shows very much. There is nothing wrong with your English. I deleted your initial comment because there is a difference between saying you didn’t like or agree with Sage’s piece, and saying that Sage, herself, is “immature” as you did in your most recent comment, or “self-centered” as you called her in the comment I deleted. You can call her writing, or her world view as expressed in her writing “self-centered”, but you cannot call SAGE self-centered. There is a difference. If you know what real censorship is, then you should know that that is not what is happening here. Criticism is one thing, name-calling is another, and I choose not to allow name-calling in the comments of my blog. I am sorry that you disagree with my decision to run the piece, and I understand that you have a unique perspective on Iraq having lived there. I’m still not sure I understand why the piece upset you enough to leave the type of comments that you did. Sage’s essay was intended as a celebration of our shared legacy of hand work, and a gentle reminder of our common humanity. I welcome all comments on the subject, as I believe we have much to learn from one another. However, I cannot allow comments that contain personal insults, and those that do will be deleted. This is my first time leaving a comment and because I’m not computer savoy I hope I’m doing this right. Well… I love your podcast. I am the only one in my family who knits and until recently the only one I knew who knitted. You were my first knitting friend. Listening to your stories gave me the courage to try something other than a scarf. First it was a washcloth, then a flower, a cat toy and a hat. My most recent adventure, was a sweater. My nerves only allowed me to try a baby sweater but it was for a good reason. I thought to myself, if I mess up in a baby sweater there is less to frog. 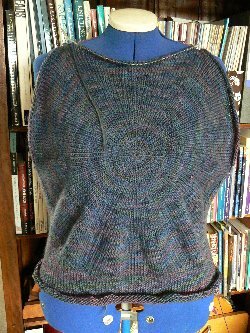 It was a good decision seeing that I had to frog the top half four times, knit the right sleeve twice and redo the collar two no three no… well you get the idea. But the sweater is now done and looking pretty good if I can say so myself. The funny thing is I still haven’t made a sock. I read the pattern and a knot forms in my stomach, it’s just very intimidating to me. Along with the courage to knit new things came a courage to write. I always wanted to but was afraid of trying. After finishing the sweater I wrote an essay about my great-grandmother and crocheting. It was one I could hear playing in my head evertime I listened to other crafter’s stories. If you think it might work with one of your shows I think I’d have the courage to read it. Either way thank you. 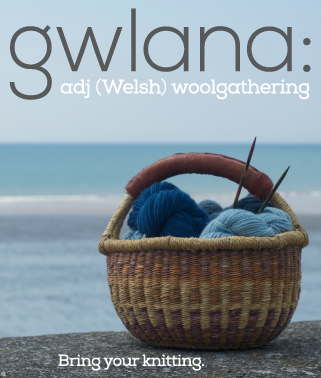 Thank you for being a friend to people you’ve never met and thank you for sharing your knitting sorrows and joys so that a growing young woman, across the Atlantic, wouldn’t feel all alone while knitting. Love your podcast!!! Love Sage’s podcast!! Love to knit!!! Love to look at the world from different people’s and culture’s perspective!! I am so sorry. Sometimes my words come out wrong. I mean only to be clear, but sometimes sound mean and that was not what I meant. I only meant to say that everyone loves their children. We all know that, or so I thought. I remember a friend had me listen to Billy Joel Do the Russians Love their Children too and it was similar from long ago. I truly believe that the Nazi mamas loved their children, knit for them lovingly as well. I wish we all did have peace in world. if knitting would help perhaps it would have happened long ago. Perhaps we need more mamas in charge who want their children to see a new day. I do not know. I am sorry I sounded hostile before, it was not my intention. Only to get my point over. I will be more careful in the future. I enjoy you, just not sage. but she is a friend and I should have kept my temper. There are so many I miss from my homeland sometimes I get a bee in my hat about it and I’m sorry. I left you another comment but I don’t think it made it to you so I’ll try this again. I’m so bummed I missed Eurovision last week-I took you with me jogging yesterday and it was too late. I’m living in Germany where it’s a bit uncool to watch Eurovision but being an American I have that bonus and can do these things and still talk about it. I just love a contest. Anyway, thanks for a great podcast which keeps me entertained and my mind off the pain while jogging ;-)!!! Brenda, the essay by Sage had me in tears – it was that touching. Thank you for including it. It was beautiful, evocative and heartbreakingly hopeful. I just finished catching up to episode 48 of the podcasts (I started listening about 2 months ago). I have really enjoyed listening to you as I knit in the evenings, especially as I am one of those people who likes background noise, and I get distracted by TV (much as I love it). I thought I’d leave you a cute story too – part of the reason I am bothering to leave a comment (shame on me). As a knitting mom you will appreciate this. My toddler loves green, it was the first colour he learned. Today I was flicking through Interweave Knits when Richard grabbed it from me, shouted ‘Green Sweater!’ and walked away, cuddling my magazine. I looked at the back, an lo and behold, there’s a green cabled sweater from a Classic Elite pattern book on the back. Guess what my next project is? I really love your podcasts and am sad that we are pretty much at the end of a series now that I’m finally caught up and don’t have them available when I want it. I do hope you enjoy your break, but please, hurry back! Brenda, love your podcasts. You have become my favorite walking companion – it’s like walking with a friend, but you never have to carry on your half of the conversation. I’ve only recently found you and have been listening to the new casts as they come out and going back through the old ones too. Who knew you are a fan of Al Franken? I am too, and luckily as a Minnesotan, I’ll be able to vote for him in November! Again, I’m stilling loving your podcast and can’t get enough of it. I wanted to let you know that PBS is showing tonight “The Secret Life of Mrs. Beeton”. How funny! Well, maybe it wasn’t so funny after all. What a sad story PBS told last night regarding Mrs. Beaton. But I do find it interesting how things circle around. You introduced us to Mrs. Beaton. I had never heard of her before and now PBS has a 1 1/2 hour movie about her. I would never have known about her if it hadn’t been for you, dear Brenda. Thanks for teaching me so much more than knit and purl. Hi, I can’t figure out how to email this to you and figure all the other knitters out there might get a bit of giggle out of this. http://www.webcomicsnation.com/jessica/activities/series.php Whoever woulda thought subversive knitting would have turned up in a webcomic. And such a cute one too! Your mention of Hay-on-Wye is very timely for me. I’m coming to Wales next week and will be staying just down the road in Abergavenny. I think I need to set aside a day just for that one town. Anything I can bring you from NYC? Need an excuse to show a visitor interesting places around Wales? Hahah, I never thought I’d hear Lordi mentioned on Cast On!! So Brenda, I have just started listening to your podcast from beginning to end and sad to say I have caught up with you in less then a month (long commutes). You have a great voice! I just finished (well soon to be I’ll finish it on WWKIP day) sweater. Thank you for the entertainment. who wrote Cold Comfort Farm? you have referred to this book several times in your podcast, so I decided I needed to read it. However, there are several books by that title on amazon.com. Help! I’m not sure how I feel about knitting being political. As others have commented, politics raises my blood pressure, which is something I generally try to avoid. That being said, I love your podcast because it is provides me a break from the everyday worries and concerns that typically run through my head. I pop on the earbuds and listen while sorting the laundry or scrubbing the bathtub. Your well-picked music and very thoughtful essays always make the work go so much more quickly. The Secret Life of Stitches was especially inspirational. I am one of those poor souls toiling away in the “doughnut hole”, with no great view in sight. I’ll hold my head a bit higher now as I carry my knitting bag from cube to lunchroom every day. Thanks Brenda! I just listened to your essay and I had to stop and comment. The story was so spot-on that it gave me nightmarish flashbacks to my three years in Corporate Hell. I worked on the 39th floor in a “doughnut hole.” We did have some outside light in each corner though. I only wish I had had such an outrageous coat of dreams to accompany me then. (I started knitting after that episode in my life.) Thanks for such a startlingly poignant story.